To keep personal and company information confidential and to prevent identity theft, a document shredder is often the most economical and basic solution. The following review of the Fellowes Powershred W-11C Cross-Cut Shredder provides essential information about this unit which will help you decide if it is suitable for your document shredding needs. The Fellowes Powershred W-11C Cross-Cut Shredder can shred a letter size (8.5” x 11”) page into 399 small pieces. This provides a satisfactory level of security if you are planning to shred documents which contain your personal or business information. It is equipped with strong and rigid solid-steel cutters which are powerful enough to slice through stronger material such as staples, paper clips, and credit cards. However, this unit is not recommended for shredding CDs, DVDs or corrugated cardboard. With the ability to rip through a whopping 880 letter size sheets in approximately 5 minutes, the Fellowes Powershred is no slouch when it comes to speed and efficiency. It can go through 16 feet of paper per minute, and the nine-inch wide entry slot makes feeding the paper a breeze. Also, this machine features an 11 sheet capacity, obliterating documents into confetti in one pass. The larger receptacle bin has a 5.5-gallon capacity which does not require emptying very often. Considering the speed of this unit, the large waste bin is an important time-saving feature. 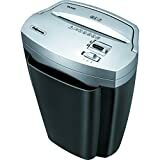 The Fellowes Powershred Shredder is very easy to operate with an automatic start and stop feature. There is also a reverse function which permits the simple removal of paper that is overfed or is jammed. This unit also has an important safety feature which switches it off and locks it when the top section is lifted to empty the waste bin. With a list price of $75.00, the Fellowes Powershred W-11C Cross-Cut Shredder provides the performance of a much more expensive unit. Easy to use and relatively speedy, it can go through a significant amount of documents in a decent amount of time. Also, the shredded paper packs down well if you are planning to use it for other uses. With regards to operational noise, this unit can be considered a bit quieter than other shredders. All in all, for the money, this is probably one of the better units that you can purchase.